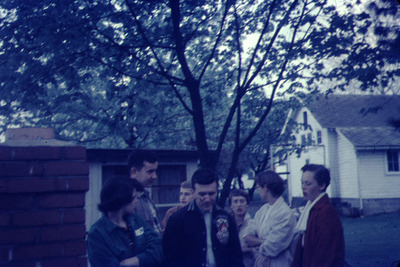 This photograph captures the Sociology Club picnic, with Professors Beers and Stroup (both Sociology professors). It is likely that the picnic was held at Professor Atley Stroup's old house. The individuals in this photograph are: Lee M. Collins, Dan W. Crain, M. Grebel, D. Craig, F. Atkins, D. Daniels, and "Wheezy".